We were checked into the Ptarmigan Inn by a lovely Aussie girl working on reception. The hotel was the PERFECT location on Banff Avenue – walking distance to the supermarket, shops and restaurants. For around $250AUD per night, we had buffet breakfast included each morning which was delicious. A nice spacious family room with sitting area and a gorgeous big window. Hot tub and restaurant downstairs also – happy days. It was cooler in Banff – so we had to utilise the few jackets and long layers that we had in our packs. The town has such a lovely vibe. The 360º views of rolling mountains and rivers definitely helped. So many cute stores and cafes to discover. We spent one afternoon enjoying some Canadian treats from the fudge factory and buying a few bits and pieces to send back home. I added to my art collection, by purchasing a special piece by a local Canadian artist. There is a gorgeous Christmas store too, which is HUGE and worth the visit. We also tried a “Beaver Tail” – one of Canada’s famous sweet treats. They’re a little like a stretched donut with toppings. Scrumptious!! We also checked out the Cave and Basin which is a National Historic site run by Parks Canada. The kids loved this place. There was an “Xplorers” scavenger hunt – where they had to find and tick off items around the site whilst learning about the history of the mountains surrounding us. There was also a sulphur cave which was so smelly, but so pretty. There are so many pretty spots to stop and explore in Banff. A leisurely drive around the mountains easily turns into pulling the car over time and time again to jump out for a hike, a photo opportunity, or a picnic. It’s nature at its very finest and we were in awe. We LOVED this lake. Located about 15 minutes drive from Banff town. It was the perfect spot for our lunch one sunny afternoon. Many people were out enjoying canoes or fishing. Lots of families and kids around playing in the water and enjoying the great outdoors. There is also a popular campground at Two Jacks – if camping is more your thing. Plenty of parking options also. A definite must see. Another spectacular spot. We packed up our dinner one evening and headed down for sunset. The glass lakes are just so beautiful, and only a 5 minute drive from our hotel. Not many car parks, but it was very quiet the night we headed down, so we pulled over on the road and had the place to ourselves. Banff is a special place, and one we plan to visit time and time again in the future. 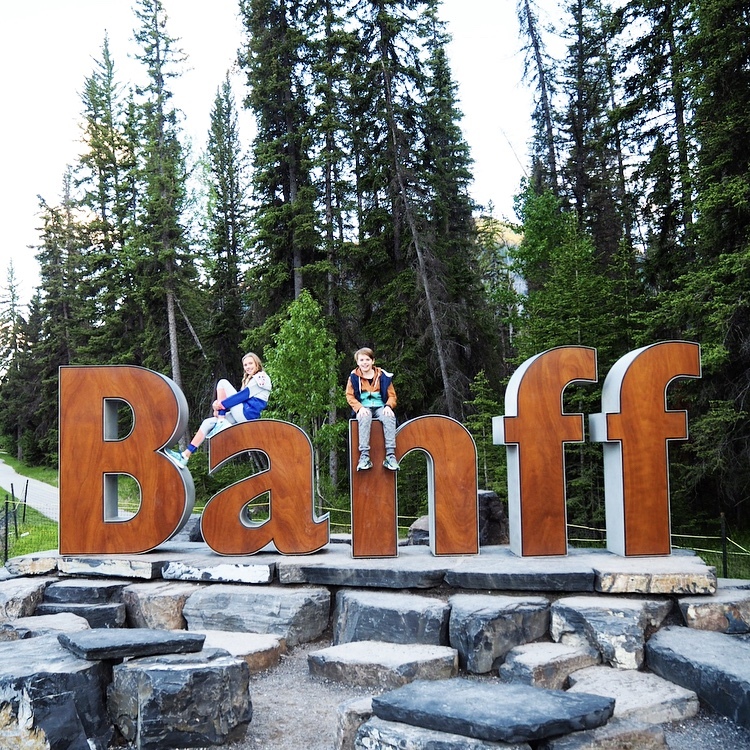 Next up – we adventure through Banff National Park!! Oh Gail – Canada is AMAZING!!! !